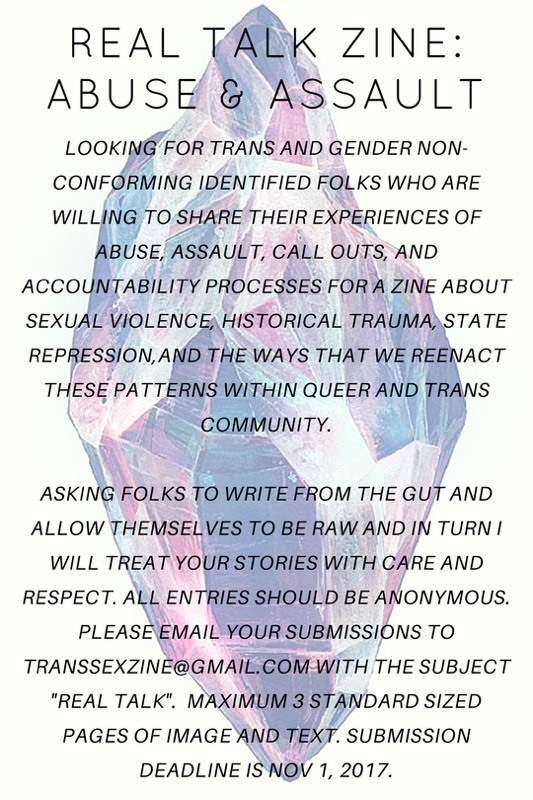 LOOKING FOR TRANS AND GENDER NON-CONFORMING IDENTIFIED FOLKS WHO ARE WILLING TO SHARE THEIR EXPERIENCES OF ABUSE, ASSAULT, CALL OUTS, AND ACCOUNTABILITY PROCESSES FOR A ZINE ABOUT HISTORICAL TRAUMA, STATE REPRESSION, AND THE WAYS THAT WE REENACT THESE PATTERNS WITHIN QUEER AND TRANS COMMUNITY AS IT RELATES TO CHRISTIAN HEGEMONY AND THE GENDER TRANSGRESSION IN EARLY FORMS OF PAGANISM AND WITCHCRAFT. ASKING FOLKS TO WRITE FROM THE GUT AND ALLOW THEMSELVES TO BE RAW AND IN TURN I WILL TREAT YOUR STORIES WITH CARE AND RESPECT. ALL ENTRIES SHOULD BE ANONYMOUS. PLEASE EMAIL YOUR SUBMISSIONS TO TRANSSEXZINE@GMAIL.COM with the subject “REAL TALK”. MAXIMUM 3 STANDARD SIZED PAGES OF IMAGE AND TEXT. SUBMISSION DEADLINE IS NOV 1, 2017. Burn things, break things, channel rage, make art, share stories, share silence, have a vessel/vehicle for your feelings. This event is for trans and gender non-conforming abuse survivors.